Dr. Kaz Dziamka, a college professor, editor of The American Rationalist (since 1996) and English section of Racjonalista (since May 2003) and writer from New Mexico. Kaz holds an MA in English philology from the Jagiellonian University in Cracow, Poland, and a Ph.D. in American studies from the University of New Mexico in Albuquerque.At the Albuquerque TVI, a technical college, Kaz teaches writing as well as Cultural and Native American Studies. In 1994, he wrote a handbook for teaching English grammar to college students, Sentences: an Introduction to Syntax. He is one of the few experts on Chiricahua Apache Indians, whose traditional culture he's been studying for over 15 years and whose impressive individualism has been an inspiration for him during the difficult adaptation to the American way of life after he and his family relocated to New Mexico in 1881. In 1996, Kaz wrote a proposal to teach "The American Humanist Tradition," a history of American secular humanism. The course became very popular with local college and university students, but also caused an outburst of protests from the conservative Christian establishment in Albuquerque. (The story received a front-page coverage in the Albuquerque Journal and became a feature article in Alibi, an independent weekly in New Mexico. )TVI's administration found itself under pressure from religionists to cancel the course and to discipline Kaz.As a result of the actions of these religious bigots, his contract was revoked for two years. 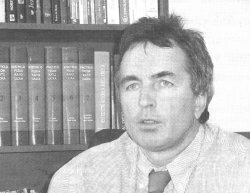 In 1998, Dr. Dziamka received the prestigious Fulbright grant to teach American studies at the Norwegian University in Tromsø. He would have been the first TVI instructor to receive such a grant, had he been still employed at TVI at the time he received the grant. After spending a year in Norway, Kaz returned to New Mexico and was reinstated at TVI in the fall of 1999. Kaz is a member of the American Humanist Association (New York), from which he received a Humanist Pioneer Award for 1999, and of the Council for Secular Humanism (also in New York). With his wife, Barbara, and daughters, Paulina and Monika, he has lived in Albuquerque since 1981. Kaz is a gung-ho tennis player, who, before a knee surgery several years ago, had been ranked #3 in New Mexico in his age category. His goal is to reach the final of the Polonia tournament in Sopot, Poland, and to play Wojciech Fibak, once a top doubles player in the world and the most famous Polish tennis player. Kaz is also an ardent admirer of wilderness, particularly the lakes and forests of northern Canada, where he travels with his brother, Tadeusz, "to listen to loons crying over moonlit lakes." As he recently wrote to Mariusz Agnosiewicz, editor of Racjonalista, "I will be fishing and looking for mushrooms and berries. Wilderness attracts me in a way which, unfortunately, I don't think is common any more. For me, life is not particularly worth living if there are no wild places to explore.This is why I have to travel to northern Canada, a place still largely uninhabited and free from corporate development, control, and greed.